I had been using traditional style peeps for years and had much success with these, however I still wanted to eliminate down time when the peep became unusable. I spent quite a lot of time thinking about and developing concepts and drawings for a new type of peep. A peep that needs no serving, is able to be installed without major tooling or bow down time, and can be adjusted if/when needed at home, in the field or even in a remote location! I spent many hours at the work bench in the garage employing different ideas and materials. I developed and produced a unique, although slightly larger than necessary new style peep. This new peep held a similar design concept as a traditional peep but this peep attached to the bow string, not into the bow string. As a result of extensive field-testing, the most common views and comments I received, the peep is awesome but needed to be smaller and lighter. So back to the drawing board I went and worked on developing an even smaller, lighter and multi-lateral (left/right hand) model. I called this new peep the Quick Sight™ “Elite”. 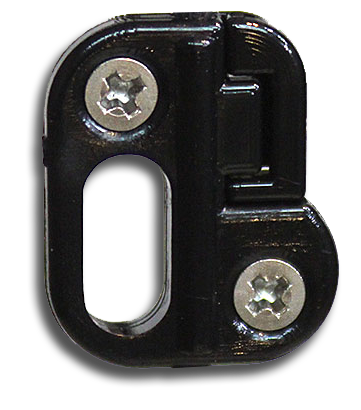 Weighing less than a gram, once installed it locks in place with the patented raised nubs built into the securing frame until user requires or decides an adjustment is needed. Held securely in place with 2 small screws and nuts, the objective was to make this peep easy to install and adjust, and success was achieved! This revolutionary new peep was conceived, designed and engineered along with the manufacturing molds, injection processing and packaging here in the USA. The goal was and is to keep all manufacturing start to finish, right here in the USA! Put your target in our sight, quickly and easily!